Property Location Located in New Braunfels, Candlewood Suites New Braunfels is in the suburbs and close to New Braunfels MarketPlace and Schlitterbahn Waterpark. This aparthotel is within close proximity of Christus Santa Rosa Hospital New Braunfels and Gruene Hall.Rooms Make yourself at home in one of the 83 air-conditioned rooms featuring kitchens with full-sized refrigerators/freezers and stovetops. Wired and wireless Internet access is complimentary, while 39-inch flat-screen televisions with cable programming provide entertainment. Conveniences include desks and complimentary weekday newspapers, as well as phones with free local calls.Rec, Spa, Premium Amenities Don’t miss out on recreational opportunities including a spa tub and a fitness center. 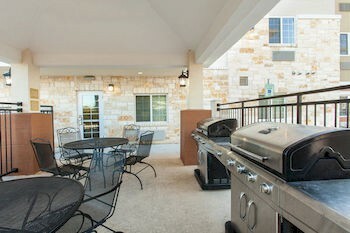 This aparthotel also features complimentary wireless Internet access, tour/ticket assistance, and a picnic area.Dining Grab a bite from a snack bar/deli serving guests of Candlewood Suites New Braunfels.Business, Other Amenities Featured amenities include complimentary high-speed (wired) Internet access, a 24-hour business center, and a computer station. Planning an event in New Braunfels? This aparthotel has facilities measuring 400 square feet (36 square meters), including a meeting room. Free self parking is available onsite.